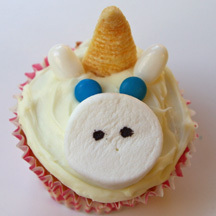 Magical for a little girl’s birthday party or any fantasy-themed event, these easy unicorn cupcakes feature a horn made from a Bugle snack! How to Make It: Frost cupcake. Cut marshmallow in half width-wise and use food-safe pen to make two nostrils on the side that’s not cut. Place marshmallow in center of cupcake. Add M&M eyes. Place Bugle horn at top of cupcake and then place white jellybeans on each side. This entry was posted on Saturday, May 9th, 2009 at 11:30 am	and is filed under animal cupcakes, fantasy and magic cupcakes. You can follow any responses to this entry through the RSS 2.0 feed. Responses are currently closed, but you can trackback from your own site.